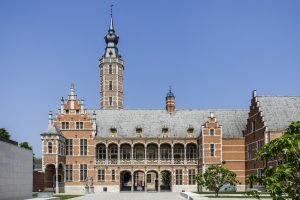 Our first outing of 2019 will give us the opportunity to visit the recently renovated Museum Hof van Busleyden which is housed in a majestic and magnicifent Renaissance palace. We will follow in the footsteps of Hieronymus van Busleyden, Margaret of Austria, Erasmus and Thomas More which will give us the occasion to exchange ideas and reflect on our changing world much like they did in the 15th and 16th centuries. We will explore all the masterpieces and treasures of the museum , learn about mastership and crafmanship and move from lively and bustling rooms to more private and quiter places. Following our visit of the museum we will have lunch in restaurant “Theatrium” situated under the majestic tower of Sint Rumbold’s cathedral. During a city walk in the afternoon we will learn more about the importance of Mechelen’s once historic role as capital of the Low Countries , discover Saint Rumbold’s Cathedral and other major churches, the former palaces of Margaret of Austria, Margaret of York, the palace of the Great Council etc. And at the same time we will pay tribute to some of Mechelen’s foremost women from the highest to the lowest, from the distant past to the present day. Afterwards, while having a coffee, we will have time to reflect on our day and exchange views and ideas with our guides. By car : Mechelen centrum > Car parking can be difficult on a Saturday (market day). We recommend Parking Grote Markt or Parking Tinel, Tinellaan. By train & bus: at Mechelen railway station, take bus nr 1 ”Centrumpendel Nekkerspoel” and get off at Goswin De Stassartstraat or Veemarkt. If you have registered and paid for this event, let the organisers know, preferably by e-mail, and they will arrange for more detailed instructions.